More tributes are pouring in for the former Vice President, Alex Ekwueme, who died on November 19, 2017 at a London hospital. 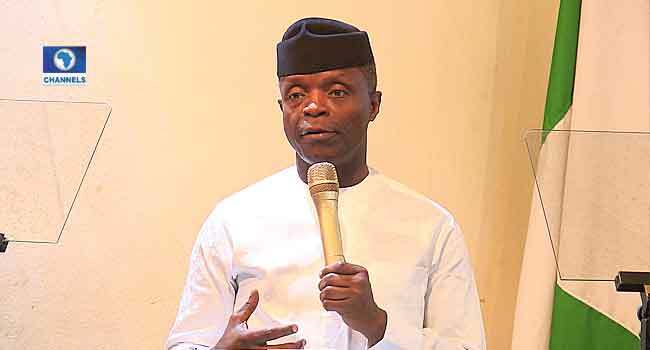 The Vice President, Yemi Osinbajo, on Monday, described Ekwueme as a selfless and timeless person who built bridges across the ethnic lines. Speaking at a parade of honour as the chief mourner in the funeral activities, Osinbajo prayed for the nation to be united as Ekwueme who is known for his loyalty wished for. His corpse arrived the country from London, United Kingdom on Monday, January 29 around 5:00 am. Family members, cabinet members and top government functionaries including the Vice President, Yemi Osinbajo, were on standby to witness the parade of honour of the former Vice-president. After the prayers, his remains were wheeled into the waiting Military Airforce C 130 aircraft en route Enugu his residence from where he will be moved to Anambra his home state for interment on Tuesday, January 30. The Vice President while receiving the corpse prayed that the death of the Former Vice President who he describes as selfless will consolidate the relationship between every Nigerian and bring about a truly united nation as the Ekweme had always wished for before his death. Dr Alex Ifeanyi Chukwu Ekweme served as Nigeria’s former Vice President between 1979 and 1983.